Located in Bandung (Sumurbandung), RedDoorz Plus @ Natuna is within a 15-minute walk of St. Peter's Cathedral and Landmark Building. Free self parking is available onsite. 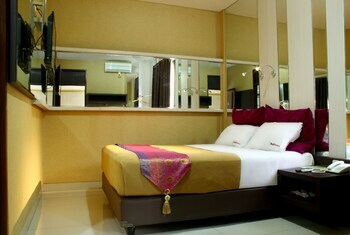 Located in Yogyakarta (Mergangsan), Agung Inn is within a 15-minute walk of Batik Plentong and Lana Gallery. Free self parking is available onsite. With a stay at Airy Nagoya Sriwijaya 119 Batam in Batam, you'll be within a 15-minute drive of BCS Mall and Maha Vihara Duta Maitreya Buddhist Temple.